The main harbor, a large fishing port, can accommodate vessels up to 160mtr in length alongside. 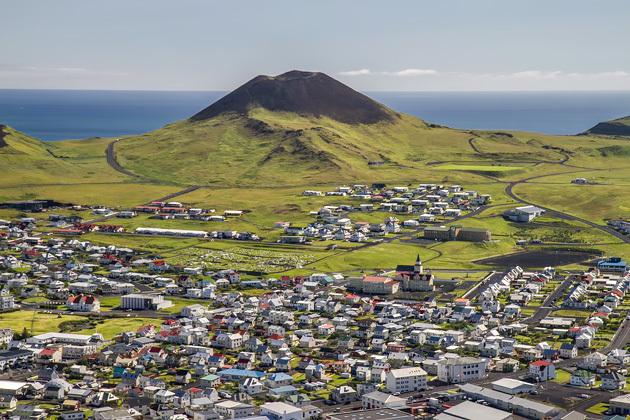 Vestmannaeyjar (the Westman Islands) are located 10km off the south coast. The archipelago consists of 15 islands with several skerries. Heimaey is by far the largest and the only inhabited island. On January 23, 1973 a volcano erupted on Heimaey and the inhabitants were forced to abandon their homes and flee to the main land. The eruption lasted for five months and when it finally grumbled to a halt the island had increased by 20% in size and a new mountain - Eldfell had formed in the field of lava. A large part of the town including almost 400 homes and buildings had been covered by lava and ash. Pompeii of the North is the name given to the project to excavate some of these homes. Its objective is to give visitors the opportunity to see with their own eyes what actually happened in 1973. Here is a unique modern archaeology dig that cannot be compared to anything else. The plan, started in summer 2005, is to excavate 7-10 houses that were covered in ash. It is an ambitious task that is expected to last several years. The first house has been partially uncovered and the next step is to continue excavating down the street. Close by is Surtsey, a protected area and one of the youngest islands in the world, formed by a sub oceanic eruption in 1963. 8 million puffins live here during the summer. The shops in Iceland are of international standard, and carry a wide variety of merchandise. Local specialties are woollen knitwear (for example sweaters, cardigans, hats and mittens), handmade ceramics, glassware and silver jewelry. Also available is a great variety of high-quality seafood. The Icelandic monetary unit is the "króna." Coins are in denominations of 100 kr., 50 kr., 10kr., 5 kr. and 1 kr. Bank notes are in denominations of 5000 kr., 2000 kr.,1000 kr., and 500 kr. All Icelandic banks provide foreign exchange and are generally open on weekdays from 09:15 to 16:00. The major cards in Iceland are EUROPAY/MASTERCARD and VISA. Cash can be obtained at every bank branch (over 170) as well as in all ATMs throughout the country. The Icelanders still speak the language of the Vikings, although modern Icelandic has undergone changes of pronunciation and, of course, of vocabulary!